Stacey's New Chapter In Life...............: Late Friday 5 question's. Hello everyone. I hope everything is going well. It's been a long tird week. I feel bad for neglecting my blog but i have been busy for the past week or so. So i know this might be late but i am going to do Friday's linkup's threw monday to catch up on things that i missed. 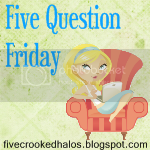 So here is Friday 5 Question's. I think a acceptable age is when they turn 18. When you are younger you really don't know what you are really doing and plus sometimes kids don't have there licences till there 18 anyway. But that's my opion. No.It's the only time that they have off from school and they need to spend time with there family after school is out. I think i would rather live without AC beacuse in the winter time i am so cold and AC wouldn't work then. Worst thing would be finding bed bugs in your hotel. I don't have kids but when i was in school i didn't beacuse we had marching band practice during the summer.